The Wellcome Institute has recently released a library of images under a creative commons attribution license. 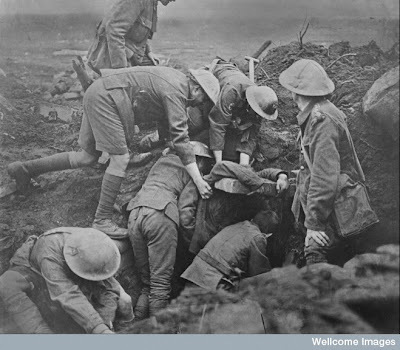 I had assumed that these would be medical pictures and of limited appeal to genealogists and family historians, but in fact they have a large category on the subject of war which includes general shots of soldiers on the battlefield, being transported by horse drawn stretcher, in the trenches. Their "war" category covers historical wars and battles, such as the Boer war and the Boxer rebellion, and includes paintings and drawings too. There may be much to interest anyone, but particularly family historians who are looking for general illustrations for their websites and printed histories may find something to fill a hole.